This Gobe 82mm The Essentials 2Peak Filter Kit includes a 2Peak UV Filter, a 2Peak Circular Polarizer Filter, an ND2 2Peak Solid Neutral Density 0.9 Filter, and an ND1000 2Peak Solid Neutral Density 3.0 Filter. Each filter in this kit fits a lens with 82mm front filter threads and can provide enhancements to your imagery. Additionally, these filters are constructed from optical glass that features 16 layers of anti-reflection coatings on each side. These coatings also offer scratch protection to the filter substrate while promoting clarity as well as color fidelity, and result in an improved beading effect when in contact with water or oil for more efficient cleaning. For enhanced durability while remaining lightweight, the optical glass for each filter is set within a magnalium-alloy filter ring. Metal screw-in front and rear filter caps are included to help store as well as transport one or more filters in this kit. For one kit filter, or at least two kit filters that are stacked by screwing them together using their matching front and rear filter threads, the filter caps can be used to protect both sides of the filter or stack. 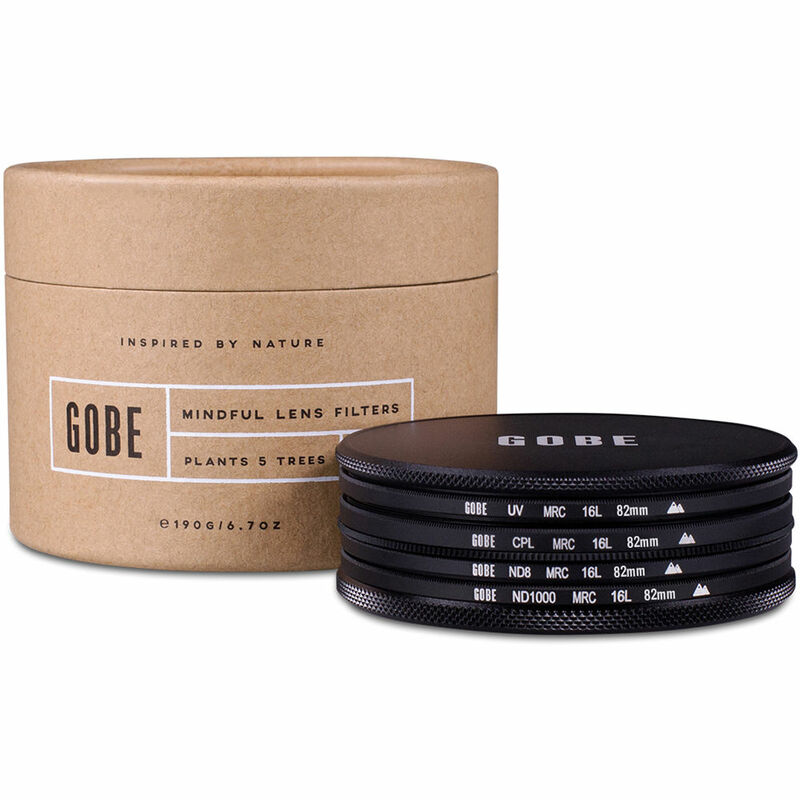 The Gobe 82mm 2Peak UV Filter is a general use, clear filter designed to absorb ultraviolet light and reduce the bluish cast of daylight. Aside from the reduction of unwanted blue casts, no additional coloration or contrast is created, and adjustments to exposure are not required while using this filter. The Gobe 82mm 2Peak Circular Polarizer Filter helps to reduce reflections and glare by filtering out light that has become polarized due to reflection from a non-metallic surface. The light from the sun naturally becomes partially polarized due to reflecting off electrons in air molecules, causing the light to scatter into what appears as haze. A polarizer filter arranges, and filters, this directionally polarized light perpendicularly to the reflected light, allowing for the absorption of much of this light. This results in a noticeable reduction of glare and reflections from non-metallic surfaces and an increase in the saturation of skies and foliage. A circular polarizer only differs from a linear polarizer in that it contains a quarter wave plane in addition to the linear polarizer filter. The addition of this quarter wave plane is to circularly polarize the linearly polarized light for the use of auto focus and exposure functions. Due to how the light is broken down and filtered with a linear polarizer, auto focus and exposure accuracy become skewed during use. When the light becomes circularly polarized, it permits the use of these functions. The Gobe 82mm ND2 2Peak Solid Neutral Density 0.9 Filter and the Gobe 82mm ND1000 2Peak Solid Neutral Density 3.0 Filter can be used individually or in various combinations to create a darkening of the entire image, allowing you to photograph with a wider aperture or slower shutter speed than normally required. By slowing your exposure time or increasing your aperture, you are able to control depth of field and convey movement more easily. Neutral density filters do not affect the coloration of the image and are ideal for pairing with other filters. These solid neutral density filters reduce the amount of light entering a lens by three and ten stops, respectively. Box Dimensions (LxWxH) 3.8 x 3.8 x 2.85"